“There is no such thing as bad weather, there is only bad gear”. This was some of the best advice I have ever received with respect to being a photographer. I met BBC and National Geographic photographer Ian Kellett while assisting with Alexandra Cousteau’s Expedition Blue Planet in 2010 on their visit to New Brunswick. Ian wanted to visit Deer Island in October on a very cold and damp day and I don’t remember exactly what I said when he asked about going but obviously it had something to do with the weather conditions based on his response. I was reminded again this week how good Ian’s advice was. The Maritimes have been experiencing a week-long cold snap. It’s been so cold that schools have kept kids in for lunch and some schools have cancelled classes all together. The temperatures have been near or below -20 Celsius (-30 with the wind chill) which has been a similar temperature to places like Iqaluit in Nunavut. It was actually warmer this week in Whitehorse in the Yukon than here in New Brunswick. Fortunately the cold weather has brought an upside. The mornings on The Bay of Fundy have produced a week of some of the most spectacular sunrises I’ve ever seen. As the cold air moved across the normally colder water, it has created a lot of very heavy sea fog or sea smoke as it is sometimes called. I decided that I would venture out on a few mornings to see what I could record with my camera. 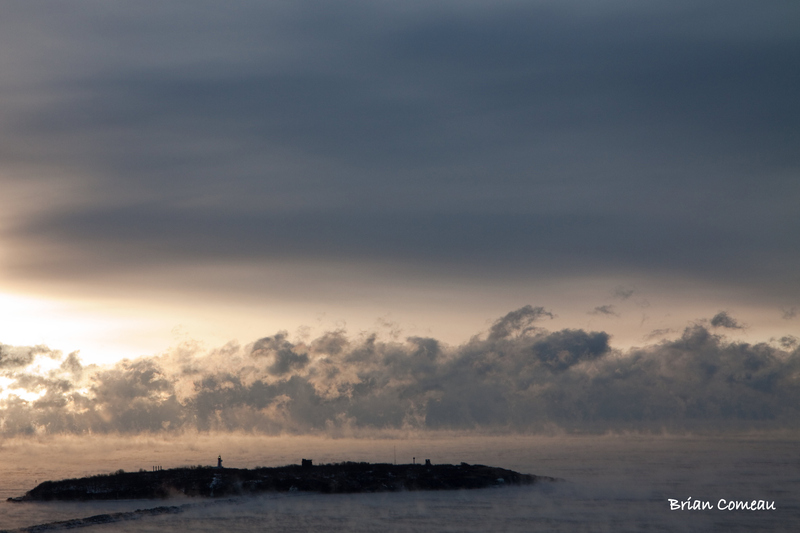 Of the two days of shooting, the image below of Partridge Island is my favourite. To provide some scale, Partridge Island is approximately 24 acres in size and the lighthouse stands about four storeys tall. In some places the fog reached close the height of the base of the lighthouse. It was likely one of the coldest weeks in recent years that I’ve gone shooting. The two days I went out to try and get a shot of Partridge Island it was so cold that even with a hat and two hoods it was only tolerable to be out of about ten to fifteen minutes at a time. I found that I was short of breath after climbing a couple of flights of stairs to shoot this image. During my twenty years of photography winter has likely presented the most challenges and the temperatures have been some of the most difficult situations to shoot in. Ian was right; your gear and clothing can make all the difference between getting the shot or not. I heard it was really cold, but I agree, the cold weather brings some great photo opportunities. I never thought much about the sunrises though. I should be more attentive! Brutally cold last week but in the 50s and pouring rain today. Crazy!